My travel mate for Ireland was my dear friend and kindred spirit, Jan. We were home less than a week and I headed off to Newfoundland, and she very generously came out here for the duration to stay with Abby and keep an eye on things. Abby loves her and is so happy to have her here and so are we. Last year when she was here, one of the donkeys had a baby - her first experience with that type of event. That didn't scare her off - thank goodness - and she agreed to come again. Well, sure enough, it happened again; in broad daylight this time, which is quite unusual. She went to town at noon and when she came home at 4 pm, there was she was - a sweet little jennet. A big surprise also because she is pure white - except for the tip of one ear. I can't decide whether it looks like she was held by one ear and dipped in white, or started to be dipped in chocolate and someone said 'no, that one's supposed to be white!' She is only the second white donkey that Samantha has ever had, and Chip's first. My girls, when they called, said 'Why is there a donkey today; this isn't any particular day.' We have all come to expect the blessed event to mark a special day, as if the birth of a much loved long earred friend isn't special enough. "Well, actually is." I assured them, "A VERY special day!" It was Wednesday, May 26th which happened to be Jan's Dad's 80th birthday and she was having a party for him at the farm. The babe's timing was perfect - just an hour before the guests started to arrive. Well of course, the baby was Jan's to name and she chose 'Molly', in honour of our Irish excursion. Perfect!! 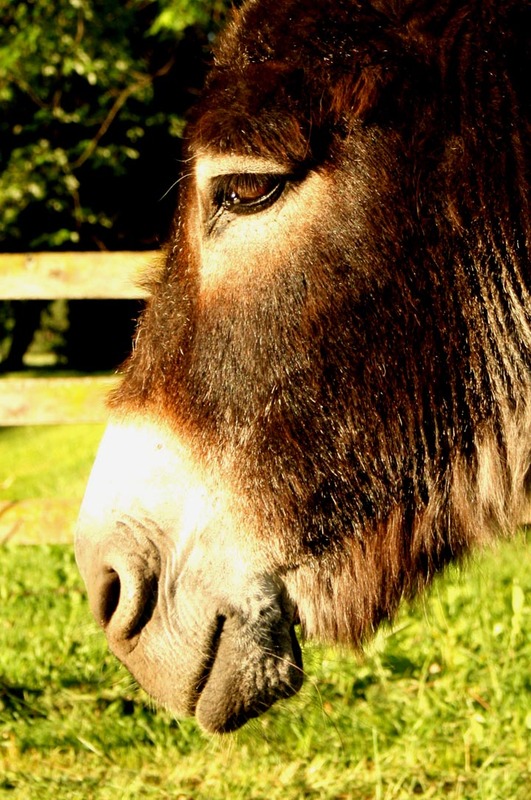 She didn't know that my very first woman donkey - the foundation of our herd and Samantha's mother, was named Molly. To differentiate this gal, we've added Malone, which sounds quite charming with the little one who had been born just the week before: Paddy O'Malley and Molly Malone. Nice ring. Actually, the first of our three white donkeys that we've had in 28 years, was named 'Malone', so it's significant all way around. Oh my though, I do wish I would have been a fly on the fence the following Wednesday. Jan told me that if she had a blog, she surely would have written about it. So I will. It seems on that morning, wee Molly Malone was on the wrong side of the fence. She must have been laying near it and rolled over, as they never get out. The baby was running up and down the fence and there wasn't a snowball's chance of catching the little dickens. So Jan called Ashley, who caring for five children at the time and not able to come and rescue her. Ashley advised her to 'grab the mom, bring her out and the donkey babe will follow her back.' Proper advice to be sure. IF Samantha would have had a halter on. Poor Jan. She took Ashley's advice but had no way of knowing that Ransom possesses super-radar for an unlocked gate. Being ever helpful to his herd mates, when the wind caught the gate, Ranson spearheaded the Great Escape. Poor, poor Jan. She was supposed to be on her way to work. She had to call to tell them that she'd be late as she had to capture a bunch of silly asses (I'm sure she didn't say that), to which the person on the other end of the phone declared that that was the first time they'd ever had that excuse. Ransom is a sweet, dear, lovely fella; but he is a transport truck. He is so big and thick and strong that he can easily go wherever he wants, whenever he wants. He also did not have a halter on. Jan said that she got a few of them in, which for an unseasoned donkey catcher, was quite a remarkable feat. She captured big ol' Ransom and got him back. 'How did you do that?' I asked - quite impressed with that achievement. 'I just put my arms around his neck and led him in.' she stated matter-of-factly. Oh how I would have loved to see that. Jan is not a country girl. She's an animal lover to be sure, but to most people, Ransom would be totally intimidating for his sheer size in comparison to everyone else. She got a couple of the other ones in too, which would have been tricky beyond belief to do that alone with a big long gate that swings open too fast and too wide. Meanwhile, she had to get to work. Ashley couldn't come, and Jaime was no help as she was in the midst of delivering Spencer. Again, Jan turned to Ashley for advice. 'Just leave them.' Ash advised her. 'They're fine, they won't go anywhere.' With no one else to rescue her, she had no other choice. And indeed, the donkeys just would hang out, leisurely enjoying the afternoon, delighted to finally get to the grass on the other side of the fence. Still concerned about having to go home to wild asses everywhere, Jan recruited someone to come from the city to help her round them up. By this time, apparently it was pouring rain and I'm sure she was dreading the task at hand. But lo and behold, when she arrived, they were all safely in the field, most likely having a little chuckle about 'entertaining the rookie'. I kinda feel bad about putting poor Jan in that situation. I certainly should have had the phone numbers of the numerous wonderful neighbours who would have gladly come to her rescue. Actually, it was a kindly neighbour who noticed them out and put them back in. And I should have shared the secret of Capturing Loose Asses. I get a slice of bread. I hold it up and say 'Look what I have.' and they follow me anywhere. I just walk one step ahead of them like a Pied Piper, well, a Breaded Piper in this case. If ever their minds start to wander and they get sidetracked, I just hold it up again and the bread magnet snaps them right back into line. I am quite afraid that when it comes time for us to head to Newfoundland again and we are hoping that Jan will give up her comfortable city life to move out here to the boonies, that she'll say, 'Are you crazy? No more donkey farming for me!!'. She tells me though, that it was 'the most excitement and fun' that she's had in a long time. I hope that she wasn't just saying that to ease my guilt. What a sport. She can add Donkey Catcher to her resume which already lists two-time Donkey Midwife. The only dark marking on wee Molly Malone.